The London 2012 Olympic Games have been heralded as an outstanding success. Crelos Associate Consultant and Triple Olympian Miriam Luke was Village General Manager of the Rowing and Canoe Sprint Village. The village provided secure accommodation in a performance-focussed environment for all those athletes competing at Eton Dorney. In this article Miriam shares her experiences of providing inspirational leadership to ensure a thousand Games Makers successfully delivered the Rowing and Canoe Sprint Village vision. For many people there is no greater motivation than to be involved in the Olympics. The first direct route is to compete as an athlete for the prize of a gold medal, in the UK this summer there was another route. Signing up as a Games Maker, whose tens of thousands included volunteers and workforce, did not bring glittering rewards but provided a very special once-in-a-lifetime experience of being part of a unique event, the home Games of London 2012. I have competed at three Olympics as a rower, with a dream of being the very best and reaching the lofty heights of the medal rostrum. On the third occasion I finally succeeded in winning a prized silver medal at the Sydney Games in 2000. Since London’s bid won the right to host the Games, I have wanted to be part of it. 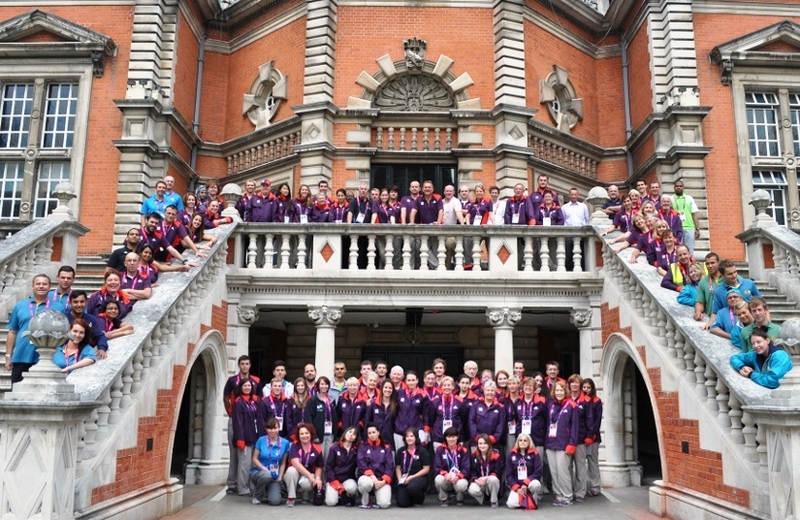 My body is no longer physically up to competing as an Olympic athlete so I looked for a way to use my people leadership talents and was successful in my application to manage the Rowing and Canoe Sprint Village, based at Royal Holloway University of London. Opening Ceremony Day is the mother of all immovable deadlines and I joined LOCOG with 18 months to go. Initially the team comprised of one member, myself, however this team would grow to a workforce of over a 1000 people before the Games opened. Most of these Games Makers would join the team at the beginning of July, with only two weeks left before we were operational. The village and accommodation was based at a university and so we only had access to build and set up the village once the students had departed for their summer break, from the second week of June. We had four hectic weeks to erect three massive marquees, set up offices, a security command centre, accessible accommodation and a fully serviced laundry, all based in 20 cabins. Plus all the Games Makers and contractors needed training in their roles. Planning is integral to delivering a successful event and for a village this is vital. Core to this planning should be the needs of the client, and our clients were high performance athletes with very specific requirements, if we got them wrong the Village would fail. In the summer of 2011 the athletes competed in two test events and the insight we gained from them during this helped us to understand their needs and create our vision. Once the functional area managers were on board, and taking into consideration the test event learning, we set our vision for the village – ‘A safe and secure village where athletes can relax and go on to perform at their personal best’. Key to the success of this vision was how it translated into the functional areas in the village. What did that mean for transport, housekeeping, catering, facilities management, athlete recreation, resident centre, team liaison, technology, workforce, security, etc? We could deliver the most amazing athlete recreation area but we still needed to meet the athletes’ priorities - getting a good night sleep, eating huge amounts of tasty nutritious food and getting to the venue, which is 10 miles away, to race at the right time. Getting transport to the venue is an important priority for a village. So for our transport team, the vision translated to ensuring the athlete buses ran exactly on schedule and that travel time was a reliable 35–40 minutes. An athlete will plan their routine and race countdown preparation to the minute and this will include travel time to their competition. They will practise this in the days prior to competition and test the timings work. If this is not reliable it will throw out the rowing teams’ plans and affect their performance. Athletes will not perform at their personal best if they are late to the start for an Olympic final! The main route from the village to the venue included the use of the M25 and M4, notorious for traffic hold ups. So the transport team and bus drivers perfected several alternate routes that bypassed traffic hotspots. They set themselves an average travel time target of 35 minutes and measured it daily. No bus left late, ever, and there were always sufficient buses for the athletes. The international rowing federation were so impressed they requested the team all go to work in Rio de Janeiro for the Games in 2016! Working throughout a Games is very intense and with the short time scales many areas are under pressure to deliver on time, which is particularly so for a village. A village open two weeks before the Olympics begins and operates 24 hours a day until the village closes a few days after the Paralympics. That is two months operating 24/7 and so venues, which have only a few days of competition, seem part-time in comparison. To ensure the team could operate well under this pressure it was important that we understood how our different personalities would interact. I asked all my managers to complete a simple personality profiling questionnaire and we spent a precious day offsite, at the Eton Dorney event venue, building the team and defining our culture of operating as high performance team. Later on many referred back to this day as instrumental in how we worked together under pressure. Setting the vision and engaging all the volunteers and contractors into the village culture was central to the ‘one team’ way of working. It was crucial that this message was consistent from everyone and this was led by the Village Manager. I led on all village-specific training with my managers leading on the role-specific elements in separate workshops. The village culture was set out as a high performing team. Our workforce was diverse; made up of managing directors and school leavers, experts in their fields and career beginners. However, no-one had previous experience of working in an Olympic Village; we were all first time learners. Our teams would only be as good as the weakest link and people learn at different speeds so we needed to help those who needed extra support. This would be vital at times when people were tired and struggling. Every role, no matter how small or menial, was important to delivering the village experience for our athletes and teams. Some functional areas were extremely busy at times when other areas were not. Late one evening I found transport and catering making up beds ready for unscheduled arrivals, to help out housekeeping who were over-stretched as the rowing and the canoe sprint teams swapped over. The last athletes departed the village on the 4 September and as the final bus to Stratford pulled away we received a phone call, it was one of the teams calling to ask if they could come back that evening as they felt they so welcomed and well looked after at the Rowing and Canoe Sprint Village. The slogan of London2012 was about inspiring a generation and the village did just that. It inspired a 1000 people in a very short time, to deliver an outstanding experience to the athletes and teams that stayed there. Those 1000 people also had an unforgettable experience of working extremely hard with very tough deadlines and they enjoyed it. I am now looking for my next inspirational challenge.